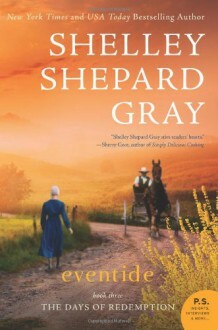 Eventide is the riveting conclusion to The Days of Redemption trilogy by Shelley Shepard Gray, celebrated author of tender Christian romance novels set in Amish country. Honest and faithful Elsie Keim falls for her new neighbor, Landon, but she can’t bear to tell him the truth: She’s going blind. Landon is enamored with Elsie. When Elsie’s brother Roman steps in and shares the truth of Elsie’s disease, Landon is floored. His job is demanding and takes him away from home, sometimes for days at a time. He wonders how he’d be able to keep up with his responsibilities and take care of Elsie.In Eventide, three generations of the Keim family come together to make their dreams come true. Shelley Shepard Gray, bestselling author of the Sisters of the Heart books, draws her Days of Redemption trilogy to a heart-warming finish.